The first "Harry Potter" film took a few critical knocks last year, but went on to make close to $1 billion at the worldwide box office. The second in the movie series, "Harry Potter And The Chamber Of Secrets," opens this Friday, and the film's star Daniel Radcliffe tells The Early Show's Anchor Harry Smith audiences ain't seen nothing yet. "I think it is better. But the first film was like really special. But I think the second film is even better," says Radcliffe. "It's a lot darker and it's a lot edgier, but at the same time you've got people like Kenneth Branagh and Rupert Grint when he's belching out the slugs. That provides a balance of kind of — a dark side and a light side." Director Chris Columbus, whose credits include "Home Alone" and "Mrs Doubfire," says the moment an 11-year-old Radcliffe walked in for his Harry Potter audition, his team knew they had found Harry. The 13-year-old says the ease of his transformation to his fictional alter ego could be linked to the friendly atmosphere on the movie set and a well-written script. But, Radcliffe doesn't carry the film alone. His young co-stars, Emma Watson (Hermione Granger) and Rupert Grint (Ron Weasley) lend helping hands to Harry. "We're kind of quite like our characters," explains Radcliffe. "Because our characters bond, because of who they are, I think because we're kind of like them, we all bond the same way." And what is it like to be Harry Potter? "All my friends treat me exactly the same as we always have," says Radcliffe. "And we always do exactly the same stuff, which I mean, we basically have pizza parties and just come around and eat pizza and be lazy." He emphasizes that he defines a normal childhood as having loads of fun. "And that's what I've been doing the last two years." 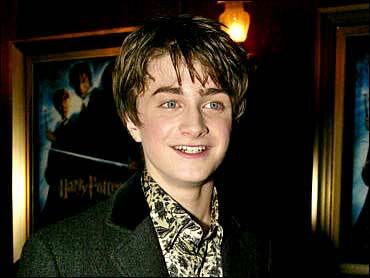 The film franchise plans to do seven movies in all, but a growing Radcliffe may not be able or want to play the adolescent Harry Potter. "I'm definitely doing the third one. After that, who knows really?" says Radcliffe. "It's too far. Each one takes a year to do, … I don't know … let's tape the third film. And I'll take one film at a time." Like most boys his age, Radcliffe isn't exactly sure what he will focus on as an adult. He says he likes acting but would like to try writing and directing. Will he want to shake the Potter image in a few years? "Harry Potter's such a major achievement … it's not something I want to just forget," he says.